Common Name: Wolfberry fruit, Lycium fruit, Barbary wolfberry fruit. Part Used & Method for Pharmaceutical Preparations: The ripe fruit is gathered in the period around the Summer Solstice (tenth solar term), and then it is dried in the shade. Meridians: Liver, kidney and lung. Functions: 1. To tonify kidneys and promote the production of essence; 2. To nourish the liver and brighten the eyes; 3. To moisten the lungs. 1. Deficient yin of the liver and kidneys manifested as dizziness, blurred vision and decreased eyesight. Wolfberry fruit (Gouqizi) is used with Chrysanthemum flower (Juhua) and Prepared rehmannia root (Shudihuang) in the formula Qiju Dihuang Wan. 2. Deficient yin of the liver and kidneys manifested as soreness of the lower back and knees and nocturnal emissions. 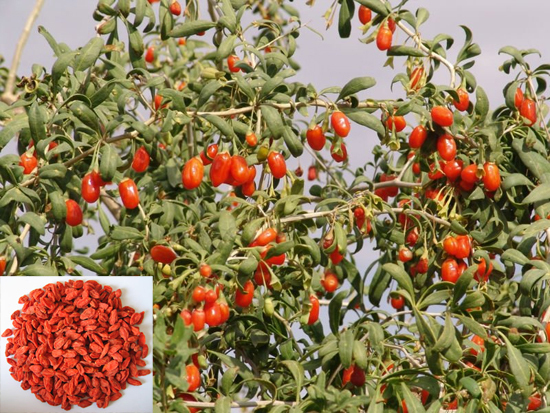 Wolfberry fruit (Gouqizi) is used with Prepared rehmannia root (Shudihuang) and Asparagus root (Tianmendong). 3. Deficient yin of the lungs manifested as cough. Wolfberry fruit (Gouqizi) is used with Anemarrhena rhizome (Zhimu), Ophiopogon root (Maidong) and Tendrilled fritillary bulb (Chuanbeimu). Dosage: 5-10 g, decocted in water for internal use. Cautions & Contraindications: This herb is contraindicated in cases of diarrhea due to deficient spleen.